"Diva Dog Chloe—this was a photo we had taken at "Clix Portrait Studio" of our Cava-Tzu named Chloe. She is 6 months old in this photo. My 8-year-old dressed her up for her photo… hence the photo title of "Diva Dog Chloe" :) She is a very loving lap dog, great with kids and although leery around other dogs, is great with our 2-year-old Golden Retriever. She was hard to housebreak (like ALL little dogs, it seems), but very smart to learn other new tricks quickly. She loves to play and be around people. She has the protective bark of the Shih-Tzu combined with the waggy tail of the Cavalier!" The Cava-Tzu is not a purebred dog. 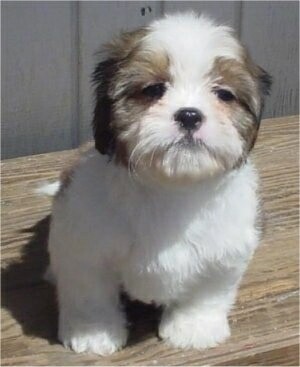 It is a cross between the Cavalier King Charles Spaniel and the Shih Tzu. The best way to determine the temperament of a mixed breed is to look up all breeds in the cross and know you can get any combination of any of the characteristics found in either breed. Not all of these designer hybrid dogs being bred are 50% purebred to 50% purebred. It is very common for breeders to breed multi-generation crosses. Charlie the Cava-Tzu (Cavalier King Charles Spaniel / Shih-Tzu hybrid)—his owner says, "He is now 1 year old and has started to calm down a bit. He still loves playing fetch, long walks and the cool weather."